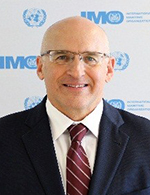 Mr. Kenney currently serves as the Director of the Legal Affairs and External Relations Division at the International Maritime Organization, London. In this capacity, he is responsible for advising the Secretary General on all legal issues associated with the functioning of the Organization, with special emphasis on matters of treaty law and the law of the sea. He also oversees the operation of the IMO's Public Information Services, Maritime Knowledge Centre and External Relations Office. Prior to coming to IMO, Mr. Kenney served as The Judge Advocate General and Chief Counsel of the United States Coast Guard, attaining the rank of Rear Admiral. He was responsible for the delivery of all legal services to the USCG around the globe, with oversight of nearly 300 attorneys and 100 legal support personnel. Mr. Kenney has spent nearly five years at sea, including service on a polar icebreaker as a deck watch officer and conducting law enforcement and security operations. Mr. Kenney holds a juris doctor from the University of San Francisco School of Law, where he was editor in chief of the USF Maritime Law Journal. He also holds a B.A. in Economics from Michigan State University.